Cast cool spells on your friends! Protect yourself and those you care about from harm! Empower Magick makes it all easy. The only HUD you need to wear, replacing your flight assist, radar, hugger, AVTracker, TP “poofer”, NPV etc. Select from our Visual, Combat, Assist or Travel packs to get just the abilities you need, or purchase the Deluxe pack which has all the features of the individual packs, plus some, at a discounted price. For more information on the Empower Magick range, including the full user guide and a video of the HUD in action, please read on. 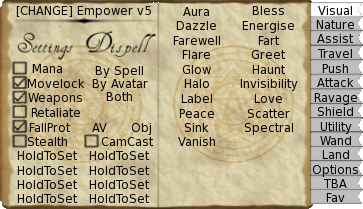 Click here to see all spells in the Empower Magick range, all of which are included in the Deluxe pack. Please click here to contact us for any queries. The Empower Magick HUD in action!